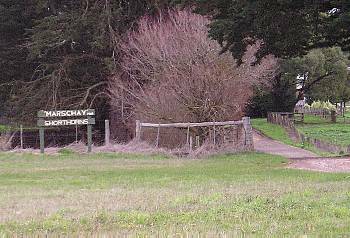 Marschay Shorthorns was established in 1975 when the three McKay brothers, Mervyn, Russell and David made initial purchases from the Glengyron, Fullum and Locherbar studs. The poll shorthorn side of the stud was started in 1979 with purchases from the Lonepine, Kelso, Magnet, Hartwould and Gairnshiel studs. In later years, Mervyn's two sons Scott and Christopher who work on the farm have taken a keen interest and have purchased their own females. David's daughters, Daina, Courtney and Samara have also showed keen interest especially at show time where they are always there to groom and lead. Later additions have come from Spry's, Moombi and Marrellan studs. Female lines include Roany, Christine, Susan, Kate, Mayside and Pamela. In recent years Marschay has sold several bulls at the Dubbo National Sale including Marschay Perseus (Sold to Marrington Stud), Marschay Rampart to Bill Graham (Orange), Marschay Tobias (Sold to Clargo Stud) and Marschay Uptake (Sold to Owen Jerry, Nombi Park Stud)..